Scroll on to see highlights from this extraVRganza (I couldn’t resist)! 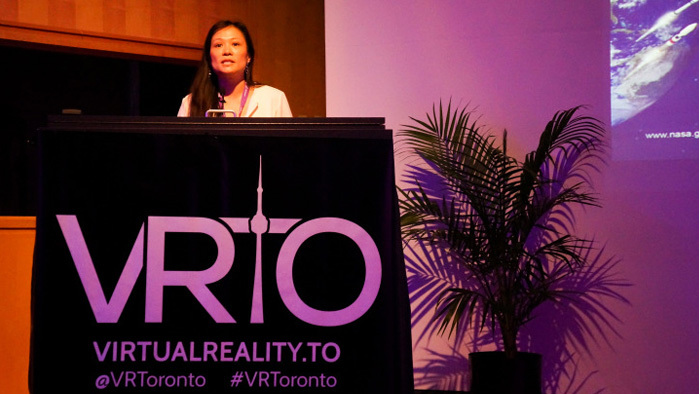 Once a budding Toronto meetup community, VRTO has grown to become an internationally recognized source of VR’s bleeding edge. More than 65 expert speakers from around the globe – including executives and researchers from Google, Microsoft, IMAX, Telefilm, and AMD – traveled to Toronto’s Ryerson University to share their expertise in the many verticals of VR, from medicine and space exploration to gaming and the arts. As a tool for training medical procedures, which was previously only available to wealthy institutions who could afford expensive machinery. In this case, VR not only causes mental memory but also the physical muscle memory of doing the actions in VR. Alongside artificial intelligence to gain the trust of patients and glean information that patients are more likely to share with a judgement-free machine than with a human intake representative. As a tool for building empathy – for example, training physicians to deliver news to terminally ill patients using simulated scenarios. As an alternative to pain medications – according to Dr. Greenleaf, VR as a distraction tool has been found to be as effective in some cases as using local anesthetic when treating wounds. The VR experience takes the patient out of the hospital environment and distracts from procedures being done on their body. Also in the vein of healthcare, long-time VR pioneer Graham Smith (below) shared his groundbreaking research in telepresence as a tool for children living with autism, allowing children to remotely attend school and control the sensory stimulus at their own will with the WebMoti device (full-length interview and article coming soon). While speakers shared their expertise, dozens of development teams shared their VR and AR experiences in the 10 interactive virtual reality rooms, halls and studios. As expected, games were highlighted as a key pillar of VR experiences, but the demos also showcased other verticals, including VR for mindfulness, interactive political virtual music videos by students from Rochester, and full-body experiences with the WebMoti and E-Moti chairs, which added physical vibrations and tactile sensory experiences. In one particular demo, I experienced an immersive documentary that told the story of a refugee who committed suicide in detainment. The documentary immersed the viewer in photorealistic renderings of immigration quarantine and featured dialogue from the first responder phone call from when the refugee was found. I’ve watched and heard similar stories in the past, but none have moved me as much as this one did. Artfully composed, it immersed me not only in the story, but in the simulated first-person experience of going through immigration as a refugee. I wonder if our world will become more compassionate as more news outlets adopt this form factor for their coverage of world news. VR is a rare breed of technology that addresses creators from all walks of life – much like the early PC, VR is attracting developers, scientists, end-users, and creators alike. This year at VRTO, the Art Gallery of Ontario (AGO) and FIVARS debuted their exhibits to be showcased at the gallery and this year’s Nuit Blanche exhibition. The ARt Gallery showcased works by various artists – to the naked eye they appeared regularly static and two-dimensional, but when viewed through the artist’s app, they came to life in new ways. The AGO’s exhibit featured classical works reimagined with elements from modern day society. FIVARS, the Festival of International Virtual and Augmented Reality Stories, also showcased works to be displayed at this year’s festival in October. The works included an immersive VR igloo, full-body VR music experiences, and standalone holograms that could be viewed without a headset. VRTO was an incredible exploration of the world through a technological augmentation and virtualization. Stay tuned for more in-depth coverage, insights, and interviews with the speakers and exhibitors!